When you're collaborating with multiple people on a Microsoft Word document, it may be helpful to mark a draft as FINAL to prevent further edits. 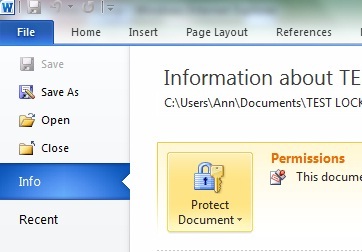 To do this in Word 2010, to to the File tab and under the Info options select "Protect Document" and "Mark as Final". This lets other readers know that this is a final draft. When they open the document, they'll see a yellow banner across the top that says "An author has marked this document as final to discourage editing". Note that discourages editing, but the reader can go ahead and select "Edit Anyway" to make further edits. Other options to protect the document include "Encrypt with a Password" so a password will be required to open the document. You can also "Restrict Editing" to restrict what kind of changes can be made to the document, either by tracking changes or by making the document "read only". If you decide to protect the document with a password, make sure you have a way to remember the password!